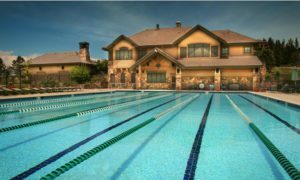 The Village Lake Fitness Center (VLFC) is a multi-million dollar workout facility featuring a heated outdoor lap pool and outdoor spa. Inside, you can enjoy an exercise and yoga studio, a full complement of circuit training machines and free weights, a TRX training room, an aerobic room with treadmills, ellipticals, step climbers, and recumbent bicycles. The VLFC is an adult-only facility and the pool is open from Memorial Day through the end of September, weather permitting. Children 16-17 may use the facility if accompanied by an adult. Open everyday from 4:30 am – 10:00 pm. A resident access card is necessary for entry. The VLFC pool opens on the Saturday of the Memorial Day Holiday weekend, and closes at the end of September, weather permitting. The VLFC pool is an adult facility. Pool hours are the same as the operating hours for the facility. The pool is not lifeguard supervised. Facility Guest Policy: Each resident household may bring up to six (6) guests to use Village facilities. A resident of that household must accompany all guests. Fitness classes: A wide variety of fitness classes are offered. Use of the fitness center is complimentary to residents; fitness classes are fee based.